You want to become a healthier human being? Do you desire for your kids and loved ones to have a well balanced life, healthy relationships and handle stress better? I’ve got one word for you…empathy. We live in a society plagued with all and everything revolving around self. It’s a crazy disservice that has a cost. Bottom line is in learning how empathy can make our kids better human beings. It’s a small word with unbelievable power and potential. Boom! Define empathy: It is the ability to understand and share the feelings of another human. Seems simple enough, but in a day and age of immediate gratification, the world at their finger tips in their cell phones it is actually harder than it sounds. So it’s time to get our empathy caps on! In today’s society we have SO many struggling with anxiety, depression, unable to maintain healthy relationships or are just simply spinning their wheels in the world of me to the me to the me square. It’s a life that’s just simply not being lived to our full potential. Do you want a powerful way to readjust that? Empathy. Seriously, it’s one of the greatest components people lack in today’s technology laden world. We can text a friend in Australia, facetime a conference call in Peru, but our ability to connect on a real, human level with others is severely lacking in today’s world. For this, we are suffering.We need physical interaction to outweigh the time behind a screen. Empathy isn’t something you can load up on in bulk at Costco. It’s bigger than your shopping cart. It takes time, consistency and is not an instinctual thing for most. But it is one of the greatest attributes you can instill in yourself, your kids and encourage for your spouse or others in your inner circle. So if I can’t get it at Costco, how the heck does it happen? It starts small. It begins by allowing yourself (kids) to peak into the heart of other human beings and not solely their own. If the world simply revolves around us, we are selfish, superficial and often walking on a shaky foundation. It’s learning to ask someone else questions about themselves and actually listening…. One of the biggest disservices I have witnessed by parents is how their kids legit know nothing about their past. From how many siblings they have, jobs they juggled as a kid, what hobbies/ interests they were into back in the day. When our loved ones have a limited view of us, it’s easier to focus on them. It’s hard to view you as anything more than as bearing the label mom or dad. Dude, you’re more than that. You have a story, chapters…you don’t have to share anything you’re not comfortable with…but withholding you of the past is a disservice and reinforces the me-ism zone. With that, how well do you know your own parents or maybe grandparents? There is power in history, in knowing, and connecting to your history. The elderly are often overlooked, underutilized. I’m not saying you have to do coffee with your grandma or dad every Thursday, but what I am saying is…don’t take them for granted. Life’s fleeting. There are so many teachable moments in our history. Empathy and family is huge…seriously huge. Not all aspects of our family are fuzzy, positive awesomeness. There are things you may not want to recall or to know. That’s ok. But our kids, we as parents desperately need empathy and knowing the past of others, the present of our loved ones is critical. Addiction and Mental Health – if this is an area that your family has been affected (and I think that’s most of us) dialogue about it. So many kids or adults are freaked out about reaching out for help or receiving a label for fear of rejection or feeling alone. That’s bull. We have Dad’s falling apart because their kid is addicted to pills and thinking what will people think, how did I fail, where do I turn? Addiction is an illness and until we begin chatting with our kids about addiction/ mental health in normal, healthy dialogue help will be met with hesitancy. We will have another generation place a stigma on things that are creating obstacles and heartache. Our kids need to know what bipolar looks like, what addiction looks like. Do you know someone struggling with these? Anyone in your family? TALK about it! One way to have our kids not feeling like their better than another human or to understand we all have layers is by realizing everyone has their crap. There is SO much hurt out there. When we have people unfamiliar with the prevalence of all this we are weakening their hearts and not allowing hearts to connect in ways that can make stronger kids and healthier communities. Volunteer: I will say this until I’m dead…volunteer. Do things with your hands, heart and time. Talk about who you are serving. What does it mean?Are you bringing dog food to the animal shelter? Why are animals without homes? Are you collecting blankets for the homeless? What has brought them to the streets?Learn from others, but listen. Go and help others. Give. Go beyond your comfort zone. 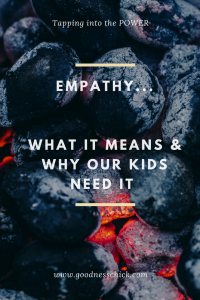 I believe when empathy is a strong force in our lives, our kids, siblings, whatever… it sets us up to be healthier, more resilient, less anxiety ridden and not as laden with the focus of ‘me’ and me and a little more me. We have a lot ahead of us, but going forward is a step.